This long-established surname, widely recorded in Church Registers of England, Scotland, and the Irish province of Leinster, is of early medieval English origin, and is an occupational name for someone who covered roofs with slate. The derivation is from the Middle English "s(c)late, slate (Old French "esclate") with the agent suffix "-er". In its original sense "a man who has to do with", the "-er" designates persons according to their profession or occupation. The surname first appears on record in England in the mid 13th Century (below), and further early examples include: Adam le Sclattere (Oxfordshire, 1273), and Thomas Slater (Yorkshire, 1297). Medieval Scottish recordings are as follows: Henry Sclatur, noted in the 1399 Council Register of the Burgh of Aberdeen; Robert Sklatare who, in 1430, sold his tenement in Glasgow, and John Sclater, burgess of Arbroath (1458). This occupational name became prominent in the Leinster counties of Louth and Longford following the Cromwellian Plantations, and is now especially numerous in Dublin. On May 23rd 1554, Edward Slatter and Alice Rooke were married at St. Mary Woolnoth, London, and on January 16th 1700, Rose Slatter married William Painter at St. Mary's, Dublin. 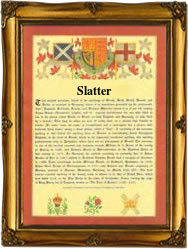 In the modern idiom the name is also spelt: Slater, Slator, Sclater and Slate, the last mentioned being metonymic for Slat(t)er. The first recorded spelling of the family name is shown to be that of Thomas le Sclatere, which was dated 1255, in "Middle English Surnames of Occupation", Worcestershire, during the reign of King Henry 111, known as "The Frenchman", 1216 - 1272. Surnames became necessary when governments introduced personal taxation. In England this was known as Poll Tax. Throughout the centuries, surnames in every country have continued to "develop" often leading to astonishing variants of the original spelling.